Nothing says summer to me more than crisp, cool, cucumber salads. They remind me of my Middle Eastern heritage and favorite growing-up foods. 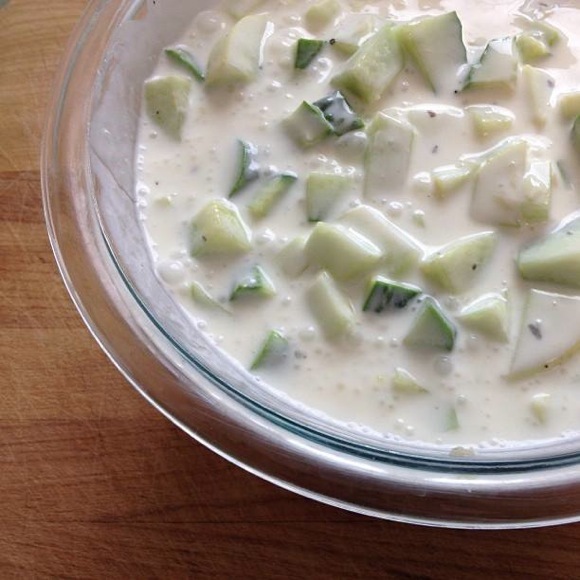 Cucumber-yogurt salad was a staple of my childhood. In my house, we have kefir around, not yogurt. In the past, I've only eaten this salad with a yogurt base. But, I like it a little bit better with kefir! The kefir's effervescent and more tart qualities combine with the garlic, salt and crunch of cukes for a tasty dish. You can use either plain kefir or plain yogurt, preferably with active cultures. The beneficial organisms make this salad a delicious and easy probiotic addition to any summer meal. If using kefir instead of yogurt, you might use less kefir or more cucumbers to account for the kefir being more thin than yogurt. Wash, peel and dice the cucumbers. Peel the cloves of garlic and mash together with the salt (I used a mortar and pestle). Combine cucumbers, mashed garlic and salt, and kefir or yogurt in a medium size bowl. Mix. Sprinkle on dried mint and mix in. Taste to adjust mint and salt amounts. Chill, or serve and enjoy! We make kefir in the Fundamentals eCourse. Please join us to learn how to make this tasty, beneficial cultured food! I just added this to the list of things to make for myself while DS is away! I also love tzatziki (sp?) sauce from cucumber and yogurt. Elizabeth — Oh, me too! Do you have a good recipe for tzatziki? Are you Lebonese???? I am and it’s so awesome that you grew up on MiddleEastern food. Growing up I didn’t (and still don’t) know anyone outside of my family that was Lebonese. The food we ate was very different than most of my friends. 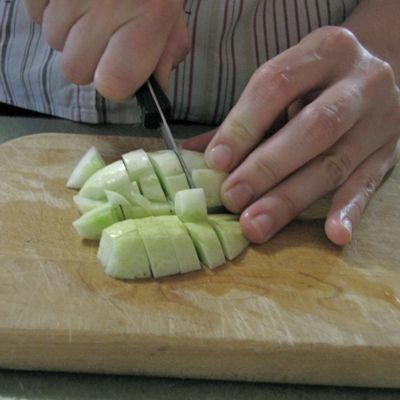 My kids love this cucumber/lebon salad, although we’ve be trying to use more kefir lately. Hi, Nancy! My family is half Palestinian. 😀 I am happy to meet you! This looks so yummy. I have mint growing in the garden so I’ll have to try this out. This sounds like it would be really nice, is it similar in taste to Tzatziki? Isn’t it funny how different countries come up with similar dishes independently? Yum, it looks like raita! I live in Lebanon & I am trying to find kefir or kefir grains. Do you know what is the name of it in arabic? Sally — No, I don’t. I’m not sure the Middle East does much kefir-ing. Mostly yogurt over there. But I could be wrong. None of my relatives have ever heard of it. 😉 Let me know if you find out something.